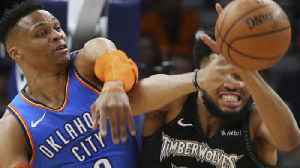 The Oklahoma City Thunder lose game one to Portland 104-99. WHAT'S GOING ON EVERYBODY.WELCOME INTO SPORTS! A BUSYDAY IN THIS DEPARTMENT. NBAPLAYOFFS, THE MASTERS,PLAYOFF HOCKEY IN TOWN. 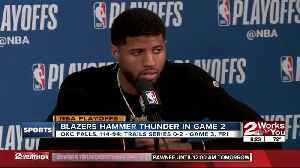 GAME1 VS THE BLAZERS OUT INPORTLAND.PAUL GEORGE WAS LISTED AS AGAME TIME DECISION TODAY BUTWOULD SUIT UP AND PLAY. BUTSTRUGGLED IN THE FIRST HALF.HE WAS BLOCKED MULTIPLETIMES. THEN TURNS THE BALLOVER--- CLEARLY THESHOULDER INJURY HAVING ANEFFECT. THUNDER TRAILEDBY JUST 6 AT THE BREAKTHOUGH. 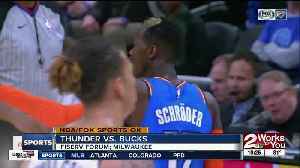 DENNIS SCHRODERTRYING TO GET THE THUNDER ONTRACK.HE HAD 11 OFF THE BENCH. 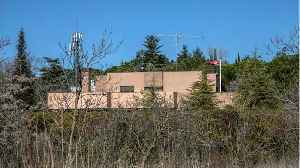 7 MINUTESLEFT, AND ITS DAME TIME.LILLARD FROM 35 FEET. AND THEN THUNDERDOWN JUST 4. 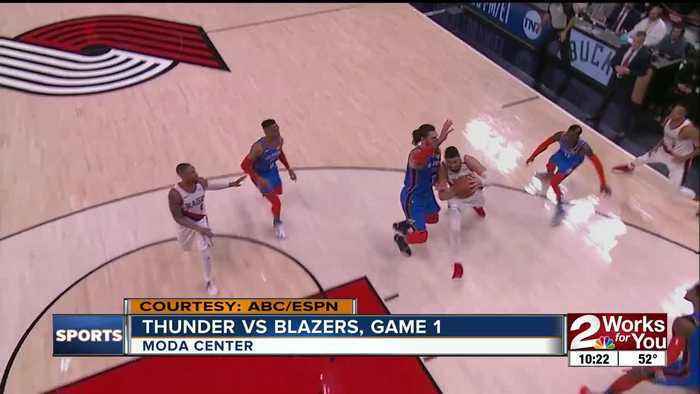 FORMER THUNDERFORWARD ENES KANTER WOULDDELIEVER THE DAGGER--- HEGETS THE LAYUP TO GO ANDTHAT WOULD DO IT!THE BLAZERS WIN 104-99.PORTLAND LEAD FOR ALL BUT 23SECONDS IN THIS GAME.LILLARD SCORES A GAME-HIGH30 POINTS. KANTER GOES FOR20 PTS, 18 REBOUNDS.WESTBROOK WITH ANOTHERTRIPLE DOUBLE BUT IT DOESNTMATTER. OKC SHOOTS JUST 15PERCENT FROM DOWN TOWN.GEORGE HIT 4 THREES.TERRANCE FERGUSON HIT 1 ANDTHAT WAS IT! 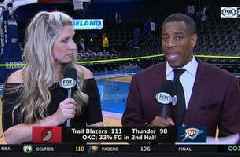 THUNDER HAVENOW LOST 10 STRAIGHT ROADPLAYOFF GAMES"SAME LOOKS AS WE GOTTONIGHT. "GAME 2 ECHL PLAYOFFS. 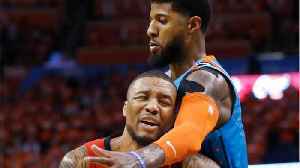 There’s no secret as to why Damian Lillard was a little bothered on Friday following his game against Oklahoma City. After winning the first two games at home, the Blazers dropped Game 3 against the.. 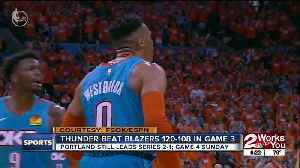 The Oklahoma City Thunder beat the Portland Trailblazers in game three 120-108. The Blazers still lead the series two games to one. 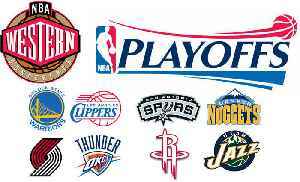 NBA Western Conference Playoff Preview With Britt & Chris! The NBA Playoffs are underway and we are picking our favorites for the Western Conference! 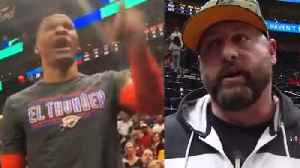 The Golden State Warriors vs Los Angeles Clippers, San Antonio Spurs vs Denver Nuggets, Portland Trailblazers..
Russell Westbrook Threatens Fan & His Wife “I'll F You & Your Wife Up" After RACIST Taunts! 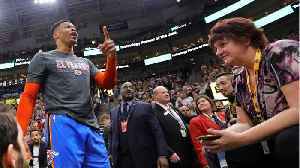 Russell Westbrook threatens to fight a fan and his wife after being provoked by the fan during the Utah Jazz vs OKC Thunder game Monday night. 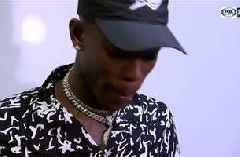 you may have already seen this video that has been going..
(CNN)After making a threat against a fan, NBA star Russell Westbrook expressed no remorse for his words, saying he will "not continue to take disrespect" from fans. 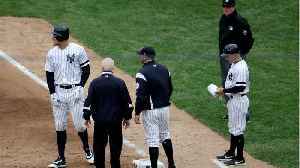 During Monday's game against the..